Who doesn’t dream of travelling the whole world? We certainly do. The giant world map locr produced in cooperation with EFI (nearly) makes it possible! The locr team already set foot on all 5 continents. In this photo, North Amerika is crossed with two steps through Michigan and Ohio and the border region between the US and Canada. On 7.5 x 5 metres, it’s easy to check on the next holiday destination or travel route – which is not making the decision easier. 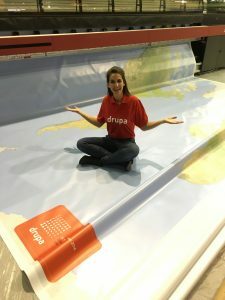 Read in this Blog Post how the giant world map was printed live at drupa! It’s the biggest map that has ever been printed at drupa.